Popcorn Indiana makes a wide range of popcorn products, starting with a slew of "classic" popcorns, ranging from simple (butter, salt), to savory (white cheddar, american cheese, bacon ranch), to sweet (classic kettle corn, cinnamon and sugar). Then they have some "exclusive" flavors like sriracha or hot cinnamon. They also make a healthier "fit" line, or the complete opposite, several caramel flavors and "drizzlecorn". And they also make popcorn chips in a variety of flavors. Everything I've tried has been good, but I won't generally go out of my way for it. 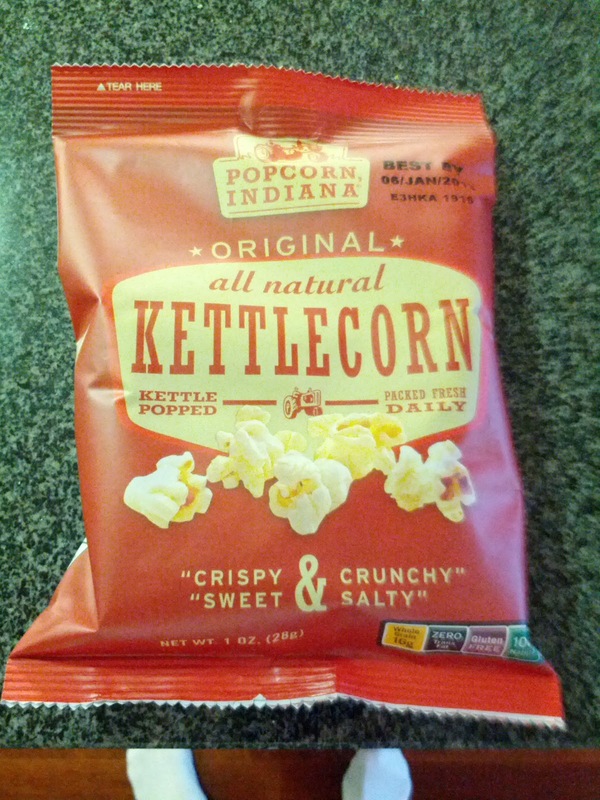 Cinnamon Sugar Kettlecorn: Decent cinnamon flavor, slightly caramelized pieces from the sugar, not bad. Hot Cinnamon: Sugary coating, like a red hot candy melted onto popcorn. Good cinnamon flavor. I like popcorn. I like chips. And I was pretty into Popcorners, a cross between chips and popcorn. 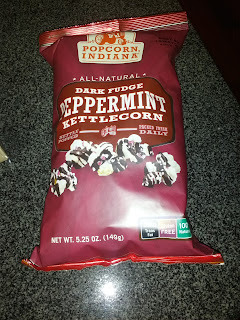 So when I saw that Popcorn Indiana had a similar product, I wanted to try some out. Available only in savory flavors, like Jalapeño Ranch or Hot Buffalo Wing. 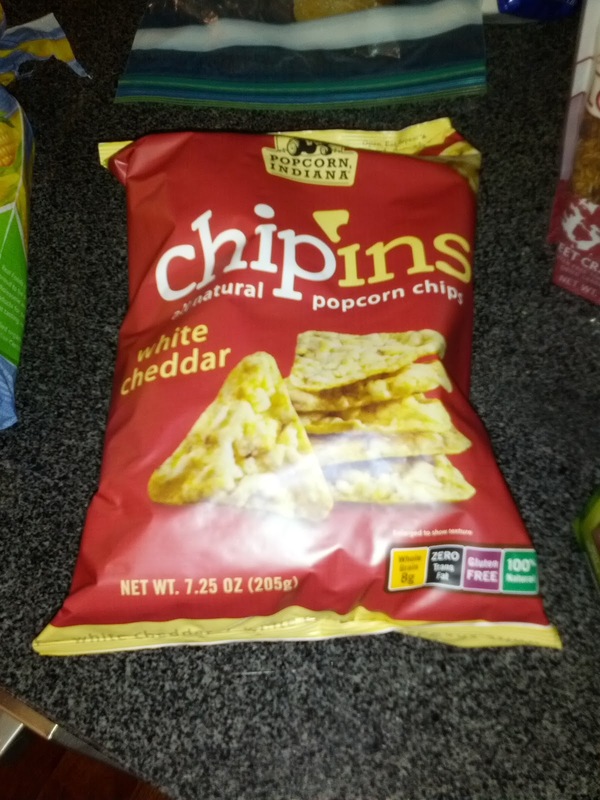 Close up of a White Cheddar Chip'ins. These were exactly like Popcorners. I would never be able to distinguish between them. Decent white cheddar flavor, nice crunchy chip, slight popcorn taste. I again liked the form factor. And, I saved the best for last. The ever-so-decadent drizzlecorn! This is their base kettlecorn, already a bit sweet and salty, then drizzled with even more goodness, like dark or white chocolate, peanut butter, and other delicious things. 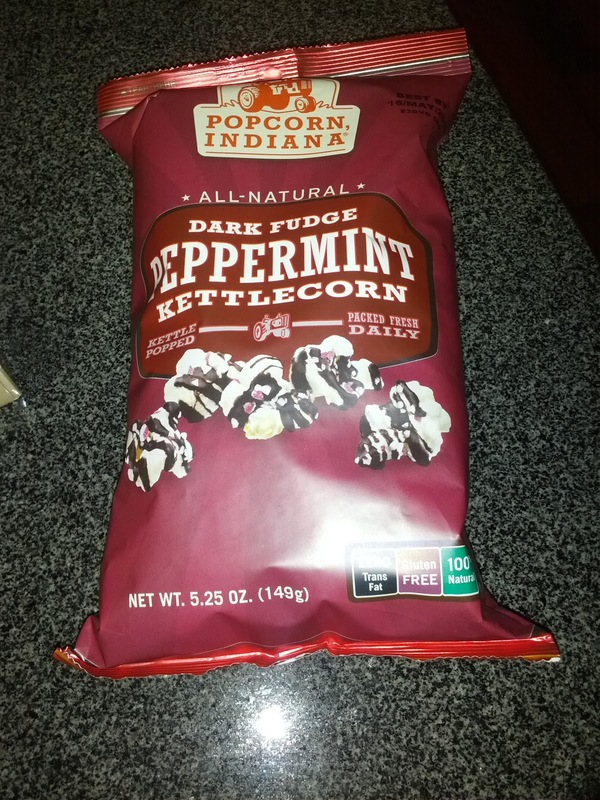 Ok, this sounded downright amazing: "rich, dark, chocolaty fudge that’s been sprinkled with the perfect amount of natural, cool, refreshing, peppermint". 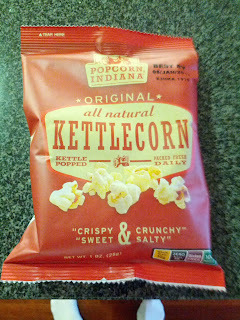 Even if I didn't love the kettlecorn on its own, this sounded VERY promising. Unfortunately, it sounded better than it was. It was very one-dimensional. It was kettlecorn, and it was drizzled with dark chocolate, and there were little bits of peppermint, all as promised, but the flavors just didn't pop. It was sweet, but not sweet enough to be a real sweet treat. The chocolate was indulgent, but there wasn't enough. And really, what I wanted, was some salty counterpoint to balance it. When I was in elementary school, we had "ice cream day" on Fridays, where you could order ice cream in the morning, and it would be delivered in the mid-afternoon as a special treat. The selection was all of the standard Good Humor ice creams, ranging from ice cream sandwiches, to strawberry shortcakes or chocolate eclairs, to the classic vanilla ice cream coated in milk chocolate. There were also generic fudgicles and creamsicles, but who ever picked those? As you can imagine, being so very fond of ice cream, I loved ice cream day. After elementary school, I stopped having these products. Not that I stopped having ice cream, we just stopped having them at school, and my family always had a plethora of other ice cream options in the house. I hadn't had any of this sort of frozen dairy treat in years, but then I spent a summer working in Sydney, and my office there had an ice cream freezer stocked with their brand of classic childhood treats. I loved exploring the entire product line, as they were totally different than anything we had here. (I think theirs are way better! Pine Lime Splices are awesome!) Anyway, I was curious how I'd feel about my old favorites now, so when I saw that a number of merchants on LevelUp or GoPago had ice creams, I started trying them all again. I really didn't like many of them, and they didn't live up to my memories. I originally thought it was just a result of nostalgia, and changing preferences, but when I went to write up this post I discovered something ... I was trying Nestlé products, not Good Humor! Both make basically the same type of items, but I definitely had the Good Humor ones growing up. Whoops! I'm starting to think I really just don't like anything from Nestlé, as I was pretty disappointed with their candy line too! 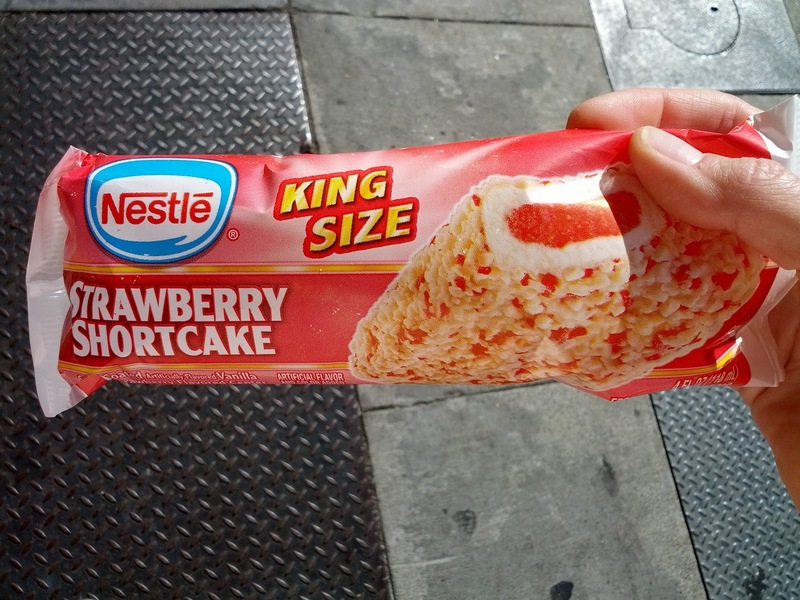 Strawberry Shortcake Ice Cream Bar. $1.79. "Creamy vanilla with a sweet strawberry center, dipped in a strawberry shortcake crumb coating." Note that the word "ice cream" doesn't appear in the description anywhere. I think that is because it isn't really ice cream! The "sweet strawberry center" was icy and not very strawberry flavored, although it was indeed very sweet. I hated it. The "creamy vanilla" wasn't creamy at all, was icy, and not very ice cream-like at all. The consistency was all off. The only part I enjoyed was the coating, the little bits of "strawberry shortcake crumb" which were basically just little bits of cake-like crumbles. They were sorta crunchy. Cookies N' Cream Ice Cream Bar. $0.99. "Creamy vanilla swirled with rich cookie bits dipped in a chocolatey cookie crumb coating." This was actually kinda good. The ice cream was again not creamy or really vanilla-y, but it was loaded up with cookie bits. It tasted like an Oreo. Coated in a milk chocolate shell that also had cookie bits in it. No real reason to get one again, but overall, not bad. "Creamy vanilla with a caramel center, rich chocolatey coating topped with roasted peanuts and a crispy, chocolatey-lined sugar cone with a chocolatey surprise." Now this is a classic! It was pretty much as I remembered. I enjoyed the crunch from the slew of peanuts on the outside, and they combined well with the plentiful chocolate coating. The caramel was sweet and gooey, and again, plentiful. They do not skimp on the toppings! The cone was really soggy and gross however. I remarked on this, and Ojan just said "isn't that how it always is?" I guess I had forgotten that part. Meh. It did have a ton of chocolate in it though. 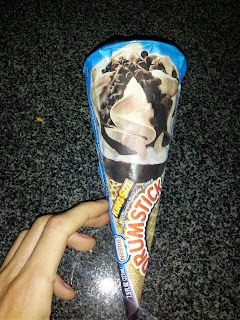 The "ice cream" was, like in all their other products, not very creamy, not very vanilla-y, not that good. Overall, pretty much what I expected, and I have no intention of trying another one anytime soon. Ojan enjoyed his much more than I did! "A king-size helping of creamy milk chocolate, white chocolate and dark chocolate topped with chocolate chips and a rich chocolatey sauce—all in a crispy, chocolatey-lined sugar cone with a chocolatey surprise." The cone size of the Kingsize Drumstick was the same as a standard Drumstick, but what changed is the amount of ice cream on top. There was easily more ice cream than cone. The cone was exactly like the original Drumstick; totally stale and soggy. I hated it. The vanilla ice cream dairy product was also exactly like the the standard Drumstick, and all of their other creations, that is, flavorless, icy, and really not good. The description doesn't actually mention vanilla, so perhaps that was actually the white chocolate layer? The chocolate ice milk product was better, a bit more creamy, with decent chocolate flavor. 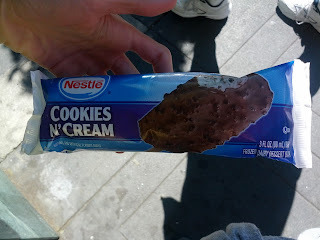 It wasn't good, but it wasn't nearly as bad as any of the other ice cream-like stuff I tried from Nestlé. The "rich chocolate sauce" was a hard chocolate shell, that like the chocolate chips, added an additional crunch and a bit of fun. 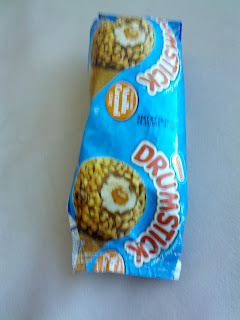 This was better than the other Drumstick and most of their other products, but I certainly don't want another. "Creamy vanilla scooped between two thick, chewy chocolate chip cookies." I should have known better. Did it live up to my expectations? No. The cookies were very soft, buttery, loaded with classic Toll House chocolate chips. But the cookies were a little mushy and strange from being frozen. The vanilla ice cream, like all of these products, left something to be desired. At least in this case, there was so much cookie that it didn't matter as much. I wouldn't get one again. I'd take any fresh cookies filled with actual ice cream over this any day. "Yummy bites of creamy vanilla, covered in a crunchy, chocolatey coating." These were basically little chocolate covered ice cream nuggets. As you may have guessed by now, the ice cream was icy, flavorless, and certainly not creamy. The chocolate coating was low quality, mostly just waxy. 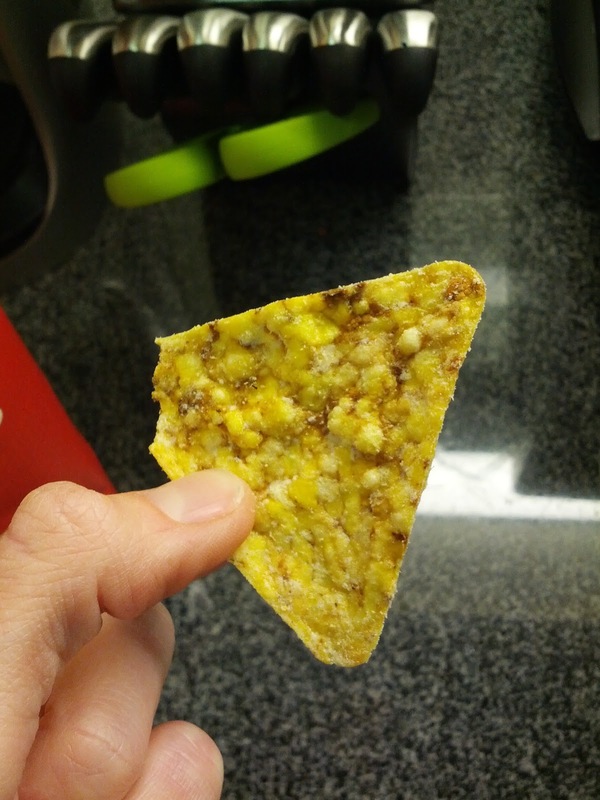 I liked the crunch in it at least? Last week, I had an interesting problem. I needed to get a little bit more food to supplement a dinner we were having at work (long story!) I had to be able to pick the food up a few hours in advance, and didn't have facilities for re-heating it, but I could store things in a refrigerator. So I needed cold items that could hold up for a few hours. And ideally, I didn't want to go far to get it. I quickly settled on Out The Door, in the nearby Ferry Building. 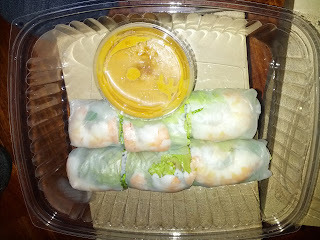 They are the casual takeout spin-off of the Slanted Door, known for having pretty good Vietnamesse food. I've been many times, and although I've never raved about it, it has always been pretty reliable, and I knew I could ask to have the salads undressed so I could mix them at serving time, and figured things like spring rolls would hold up well. There are several other Out The Doors too - one in Pacific Heights that was really awful last time I was there, but where I'd gotten decent take-out before, and a now closed one in the Westfield Mall that I used to love. The Ferry Building outpost I've mostly used just for their cooking kits and baked goods, but I've always been a fan of them. The food pretty much met my expectations. All solid, decently priced, and certainly filled my needs. Nothing was amazing, but nothing was bad. I'd go again in a situation like this. While I was waiting, I got really excited when I noticed that they had taro milk boba! Unfortunately, I hated it. 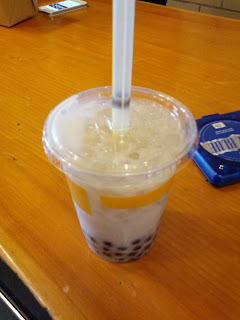 The tapioca was decent, not gloopy or anything, but the taro milk part was really bad tasting. I love the taste of taro, so it wasn't just me not liking taro. It was also a strange thickness, presumably from the taro? Sadly, I prefer the fake version from Quickly much more, and I wouldn't get another. The non-vegetarian spring rolls are filled with gulf shrimp, pork, mint, lettuce, and vermicelli. I ordered mine without the pork, as I don't like it. The rice paper wrapper was fresh and had a good chew to it. There wasn't too much of the vermicelli noodles (I hate it when rolls are 90% noodles!). There were plentiful greens, that were fresh, crisp, and really made the rolls feel light and refreshing. The shrimp was disappointing however, fairly fishy tasting. Overall, a well executed roll, but I didn't love it. They held up fine for a few hours. The vegetarian version came filled with tofu, shiitake, cabbage, and mint. They were likewise fairly well executed, but unremarkable. The peanut sauce, which I was hoping to love, was just thick and gloopy, and I didn't care for it at all. Overall, I just didn't like these much. $8 is a fair price for rolls of this size, they are $12 in the restaurant. 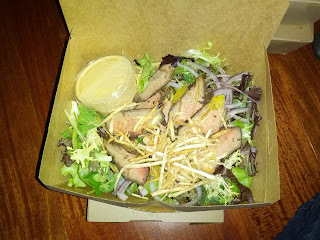 Niman Ranch Beef Salad. $9.50. The salad gave no details on the menu, just that it was a Niman Ranch Beef Salad with oranges. I'm not quite sure what I expected, but sounded better than it was. It was basically just a mixed greens salad, with some slices of valencia orange, red onion, and crispy taro root. I liked the crispy taro strips, but the rest of it, besides the beef, was fairly standard, and the red onion very harsh and a strange pairing with the sweet orange. The beef was good: thinly sliced, with a really nice crust on it, well seasoned. Overall: meh. Would not get again, and didn't really seem worth the $9.50 price tag, particularly compared to prices of the other dishes. When I lived in Sydney, I got hooked on papaya salad. Some places there made ridiculously good versions! This was good, but fairly standard. It contained shredded green papaya, shredded carrot, fried tofu strips, crispy shallots, roasted peanuts. But not a whole lot of flavor, even with the dressing. 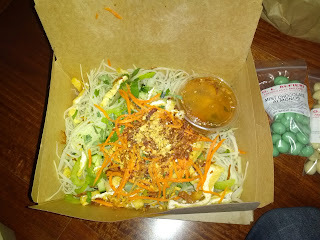 Fresh tasting ingredients, and I liked the crunch from the peanuts and crispy shallots, but still, fairly unremarkable. I had some left over, and ate it the next day at lunch, and actually enjoyed it more. The tofu and shallots were no longer crispy, which clearly wasn't as good, but the papaya soaked up the delicious dressing. $8 was a good price for a large salad, normally $12 at the restaurant. White Chocolate Mousse with Strawberry Gelee and Cookie Crumble, Salted Caramel Pot De Crème . $5 each. And finally ... desserts! 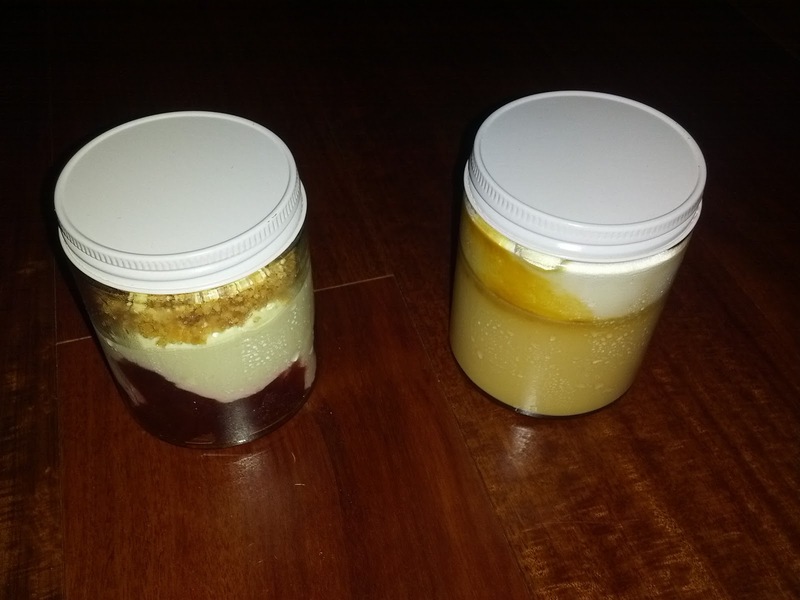 They offered four types of puddings, each layered, served in little jars. You know how much I love puddings, so it was really hard to pick just two! The first was my favorite. The main layer was a creamy white chocolate mousse. It was intensely white chocolate flavored. So often things claim to be "white chocolate" and are really just fakely sweet. This was actually very identifiable as white chocolate. The bottom layer was strawberry gelee. It was sweet, and a good flavor paired with the white chocolate. The cookie crumble on top was I think a sugar cookie, and added a nice textural element. This dish reminded me of cheesecake in many ways, creamy and rich, with fruit and cookie components somewhat mimicking crust and topping. It was a bit hard to get a bite with all three layers since the jar was fairly narrow. Overall, successful, and I'd eat it again, but I wouldn't go out of my way for it. The next was the salted caramel pot de crème. It was basically a sweet pudding, with a layer of very runny salted caramel, with whipped cream on top. The overall consistency was too thin for my liking, a bit hard to eat, particularly the middle layer. It was also too sweet. I think it may have paired really well with a black coffee, but on its own, it was a bit over the top. The salted caramel flavor was good though, and I did enjoy it, but probably wouldn't get again. $5 was a fine price for desserts of this size, and the desserts were definitely the highlight of the meal. The first time my mother and sister came to visit me in the Bay Area, I lived in Sunnyvale. I was working a zillion hours a day and had barely even been to San Francisco myself. My world basically consisted of apartment, my office, and the route between them. I had no idea what to do with tourists. Somehow, we found our way to the Scharffen Berger factory, to go on a tour. It was my first chocolate factory tour, so it was somewhat interesting. 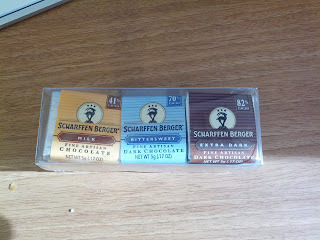 I know they are our local chocolate maker, so I feel like I should be loyal, but I don't really love their products. They aren't bad, but really aren't that great. Maybe they were better before being acquired by Hershey? 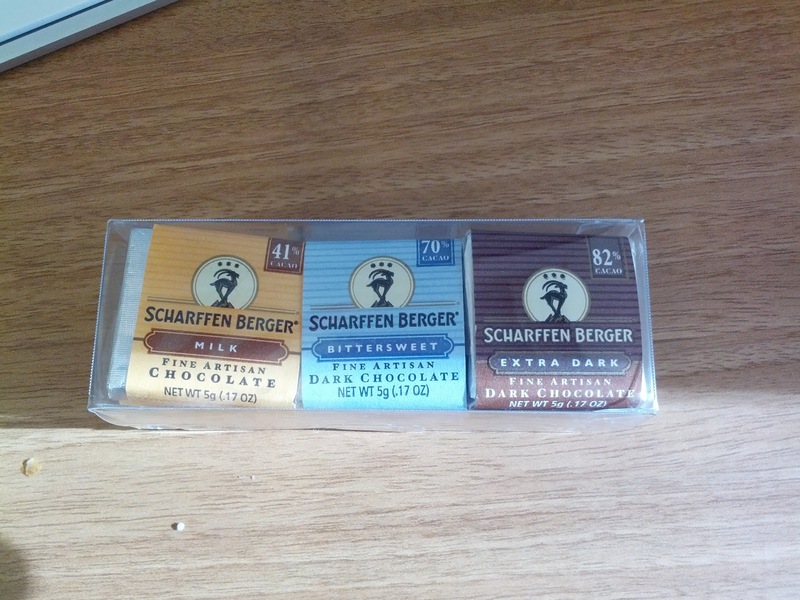 I've had a lot of Scharffen Berger over the past few years, but I didn't take notes previously. I recently received a sampler pack including a milk, bittersweet, and extra dark variety, so we tasted them as a flight. 41%: This was very creamy, very smooth, nice mouthfeel, but a milk chocolate obviously, and not something we normally go for. One fellow taster said: "not bad for milk chocolate ... just really really sweet!" 82%: More bitter, but still not smooth or refined. One fellow taster remarked that it was "really fruity. Doesn't have the best texture". None of us really liked it. Noted that it was good for baking.